We have talked at length about both graphene and nanocellulose. But this time around, researchers from the UCLA Henry Samueli School of Engineering and Applied Science, have created their version of a ‘super’ metal material. Touted to have a lightweight structure that demonstrates its specifically (very) high strength and modulus, the metal is mostly composed of magnesium embedded with ceramic silicon carbide nanoparticles. And given its ‘metallic’ nature, the incredible physical attributes of the new material opens up possibilities of applications in various fields, ranging from aircraft, spacecraft, automobiles to mobile devices and bio-medical components. 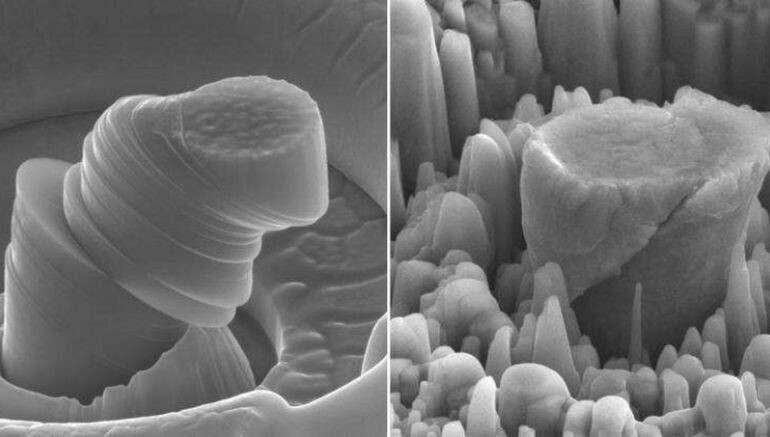 It’s been proposed that nanoparticles could really enhance the strength of metals without damaging their plasticity, especially light metals like magnesium, but no groups have been able to disperse ceramic nanoparticles in molten metals until now. With an infusion of physics and materials processing, our method paves a new way to enhance the performance of many different kinds of metals by evenly infusing dense nanoparticles to enhance the performance of metals to meet energy and sustainability challenges in today’s society. Now in terms of physics, most supporting metals used in heavy duty industries like construction and aircraft-building showcase their load-bearing structural capacity. To that end, magnesium is the lightest structural metal, which only has two-thirds the density of the better-known aluminum. On the other hand, silicon carbide is known for its inherent hardness, and the ceramic is even used in industrial cutting blades. Suffice it to say, their potent combination is what the researchers aimed for – thus signifying the fusion of strength, plasticity and hardiness in a single material. Of course beyond just theory, it was aptly demonstrated that the new metal (composed of 86 percent magnesium and 14 percent ceramic silicon carbide nanoparticles) boasts what is known as specific strength and specific modulus. In other words, the super material can withstand a large amount of weight (before breaking), while maintaining its enviably high stiffness-to-weight ratio. Furthermore, the magnesium-based component was found to showcased enhanced stability even at very high temperatures. The path leading up to this successful process of dispersal was obviously not an easy one. For starters, nanoscale ceramic particles have a tendency to cluster together due their ambit of attraction. The scientists avoided the issue by dispersing the nanoparticles into a molten magnesium zinc alloy. This step took advantage of the kinetic energy imbibed within the particles, which in turn eschewed the scope of clumping together. Moreover, the resultant metal with its infused silicon carbide nanoparticles had to undergo compression via high-pressure torsion, so as to improve its core strength factor. The study was originally published in the Nature journal.